The basic equine spa for effective therapy. This model is a spa with the water tank, filter technology and chiller placed separately beside the spa. 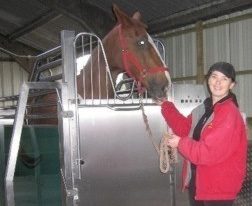 The unit takes up more space than the fully integrated models, however it is suitable for stables with limited access. In addition, this model can be built for mobile use, i.e. placed on a truck or trailer. All the safety features associated with the Premier and Deluxe models including door design, safety rails, neckguard etc. 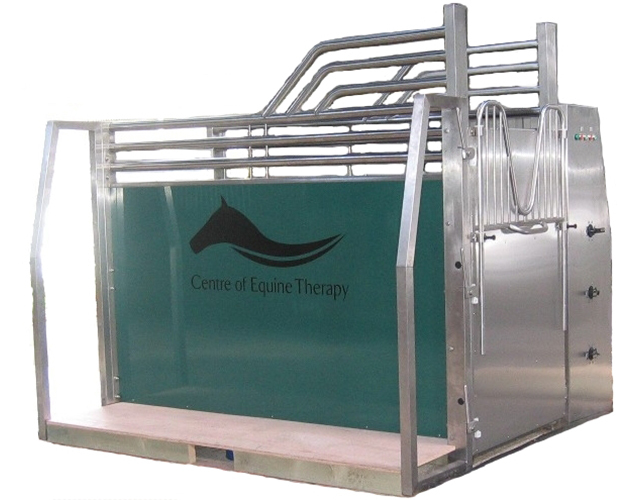 are available for this model too, so your horse can benefit from the safest and most effective therapy. Single quick release handle per door. Spa shows temperature of water in treatment chamber. 2 equine nappies / diapers [faecal collection bags]. 12 months warranty on electrical items. Flow switches [to protect pump & chiller]. Maximum run time to protect blower. Fully draining [no water left in spa after emptying]. 10 kW Chiller cooling capacity. Chiller chills the water the horse is standing in not just the tank. Inline-sanitisation [no adding chlorine every day]. Ozonator [reduces chlorine usage by up to 90%]. Variable speed pump [reduce running costs up to 90%]. Multi-cyclone / bag filter / cartridge filters.